The Pacific War Online Encyclopedia: Sprague, Thomas L.
Thomas L. Sprague was born in Ohio and graduated from the Naval Academy in 1917. He served convoy duty during the First World War and commanded a destroyer after the war. He took flight training in 1921 and held numerous staff and sea postings, including superintendent of Naval Air Training in 1937-1940. He was executive officer of Ranger during the Neutrality Patrol of 1940-1941. Sprague briefly commanded training carriers before taking command of Carrier Division 3, a fast carrier division, off Okinawa in April 1945. 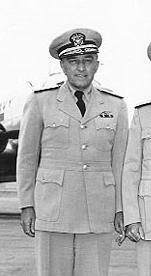 He became chief of the Bureau of Naval Personnel after the war, was promoted to vice admiral, and commanded Air Force Pacific Fleet until his retirement in 1952. He briefly returned to active duty in 1956-1957 to help negotiate base agreements with the Philippine government.